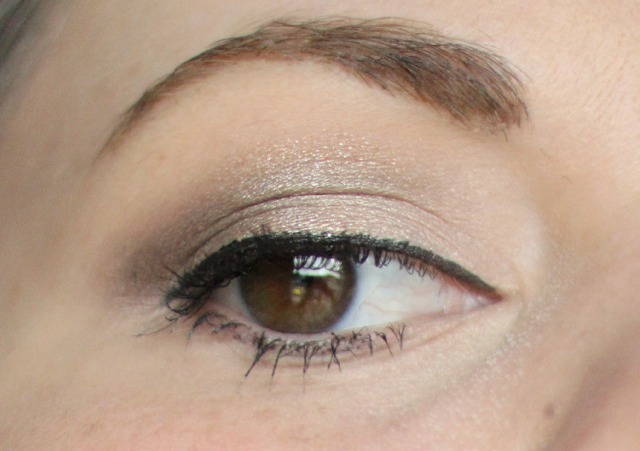 So…I found an awesome neutral palette this summer and I’ve been holding out on you guys. I have been using this for a hot minute and just keep putting off my review but today you get to read all about it. 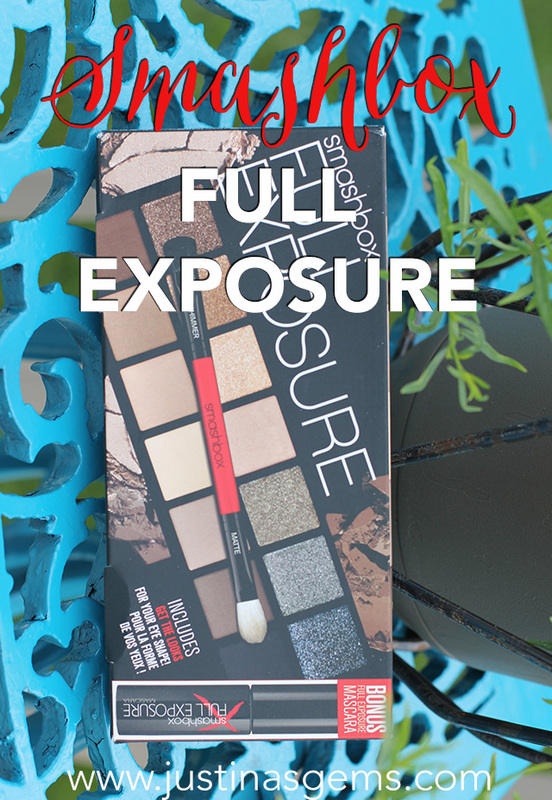 The Smashbox Full Exposure Palette is a super gorgeous neutral palette that I love, and honestly, it is the perfect palette. I will tell you below! 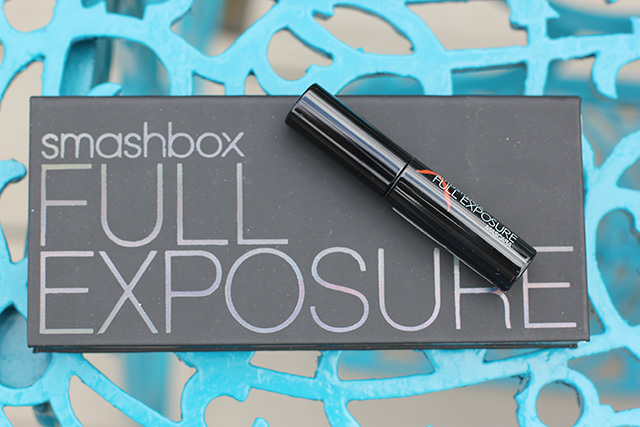 The first thing about this palette that is just flippin’ awesome is that it comes with a little tube of Full Exposure mascara. This mascara is okay. I do like the freebie but I have other favorite mascaras. But hey, bonus mascara right? 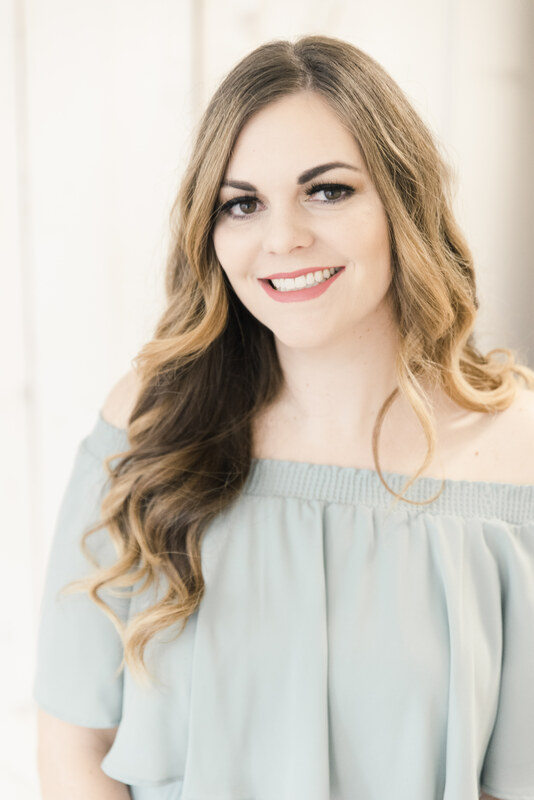 I would have LOVED to have a mini eyeshadow primer since I always wear eyeshadow primer with all of my eyeshadows and I love trying out new ones. When you open up this case you see fourteen beautiful, buttery smooth eyeshadow shades. In all the neutrals! Why I think this is perfect is that there are a row of mattes and a row of shimmers and they’re all in neutral shades. When I was in college I would’ve probably died for this palette. I loved makeup but I wasn’t very daring. I would wear the same handful of shades over and over but I was short on cash so I tried to buy palettes and I really wanted them to have ALL my shades. Matte and shimmer. I remember having a little office supply caddy that held all my makeup and thinking- I have more makeup than anyone I know! 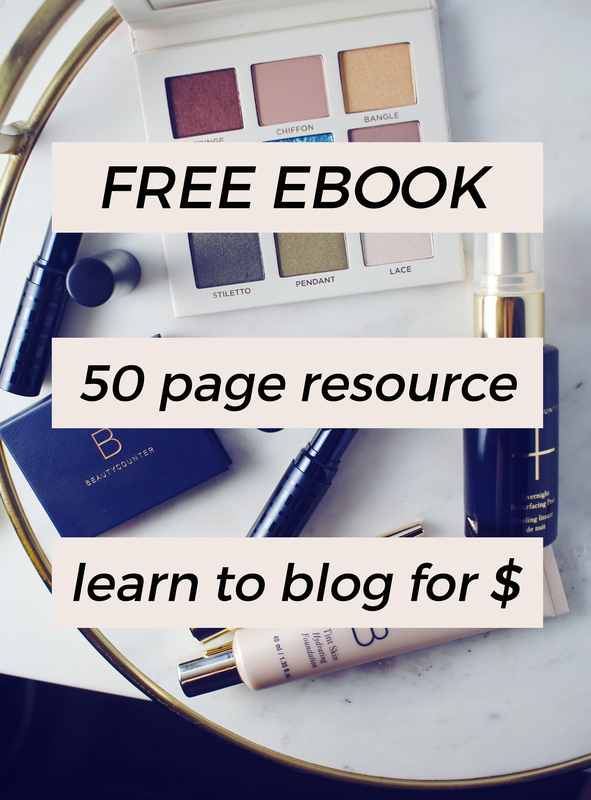 I had probably three or four lipsticks, two or three eyeshadow palettes, and never more than one foundation going at any given time. Oh the simplicity! I kind of miss it actually! The first row is all shimmers. The second row is all mattes. 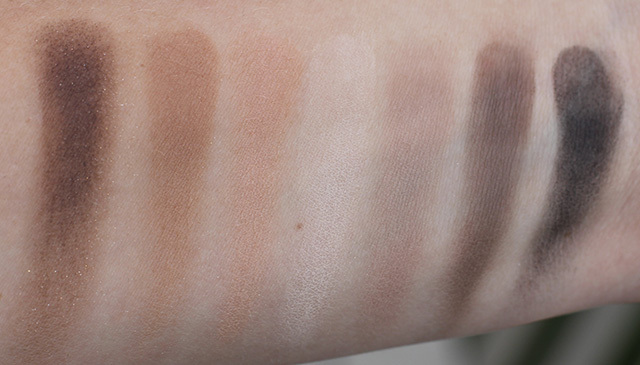 I find it a little different that the lightest shades in the palette are in the center. Don’t the shades normally go palest to darkest? 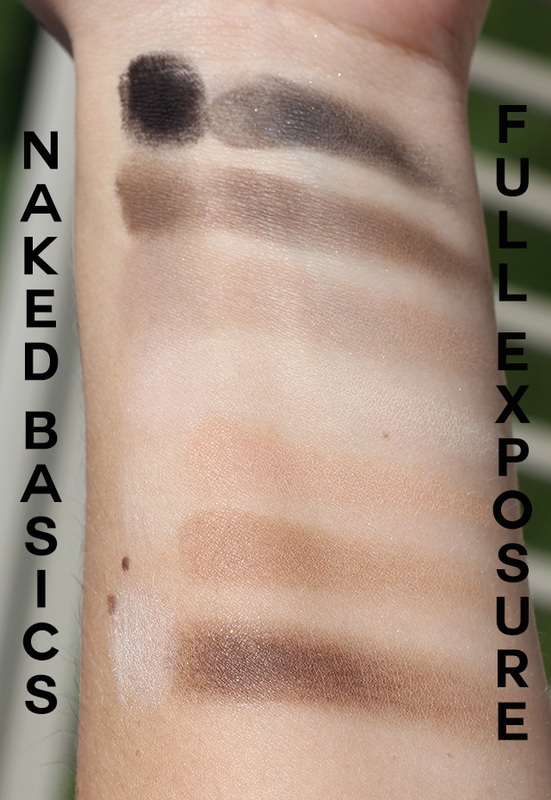 The matte shades here were totally reminding me of the Urban Decay Naked Basics Palette so I thought I would do a little investigating to see how similar they were. 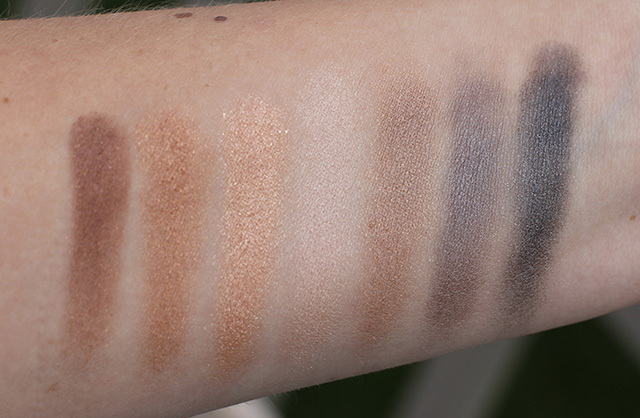 I swatched the shades in order from darkest to lightest at the top. The texture is really similar in my opinion, and the first few shades are really similar. I would say the biggest different here is that the Urban Decay shadows are slightly more pigmented. I really like this palette! 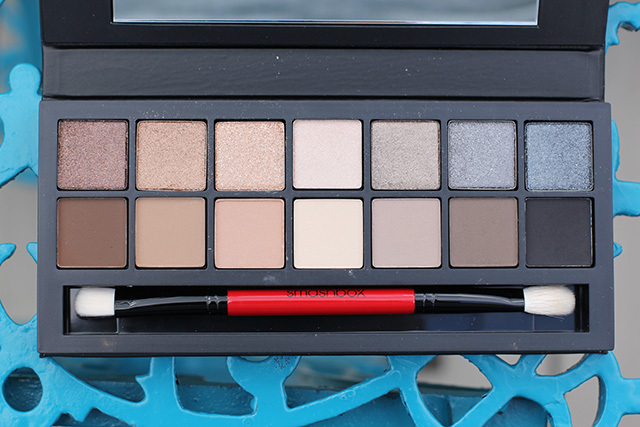 If you are the type of girl who likes mattes AND shimmers and loves neutrals I would say you NEED this palette. You can’t beat having all those great shade options right there. I have so many neutral palettes but this has the most matte and shimmer options and neutrals all in the same place, more than any other palette I can think of! Is this something you are thinking about purchasing? I noticed that Smashbox just came out with a Double Exposure palette too that I am now eyeing! If you like a smaller palette, there is also a travel size of the Full Exposure as well but there are less shadows. I love neutral palettes, and the option for mattes and shimmers in the same palette is something I love. I keep telling myself I don’t need another neutral palette, but I hear nothing but raves about this one! I love the shades in this and the nice natural neutral look you got. So pretty!